One of Loubser Transportâ€™s 91 rigs. The company is now owned 65% by Imperial Logistics. Imperial Logistics has acquired 65% of transportation specialist Loubser Transport in a move which will serve to strengthen the group’s African service offering. “The team’s knowledge of transportation requirements, particularly from a cross border and agricultural sector perspective is strong,’ says Thinus Erasmus, CEO of the Imperial Logistics Transport and Warehousing division. 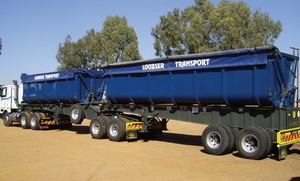 Loubser Transport is the only South African company whose head office and main depot facilities are situated on the South Africa/Botswana border post, a major corridor and gateway between South Africa and rest of SADC. The company provides solutions to customers in South Africa, Botswana, Namibia, Zambia and Zimbabwe. “Imperial Logistics’ Africa division, which has recently been created, together with our contribution to Imperial Logistics Transport and Warehousing under which we fall, provides us with a synergistic group within which we plan to expand our business,’ says Dirkie Loubser, MD of Loubser Transport. Founded in 2001, Loubser Transport today operates 91 units and has an established, expansive base of sub-contractors. Its scope of delivery is extensive and ranges from chrome, manganese and coal to tyres, glass, cement and agricultural lime, grains, as well as live stock.